Nov 09, 2018 Annual General Meeting of Byco Petroleum Pakistan Limited will be held on 26th November 2018 at 9:30 a.m at the Beach Luxury Hotel, Karachi. Jan 31, 2018 1st Quarterly Report for Fiscal Year 2017-18. Apr 28, 2017 3rd Quarterly Report for Fiscal Year 2016-17. Feb 27, 2017 2nd Quarterly Report for Fiscal Year 2016-17. An accident occurred around 8 am today at a construction site located in Byco’s complex at Mouza Kund, Hub. Unfortunately scaffolding platform collapsed resulting in injuries to few of the laborers working on the platform. Injured were given immediate medical treatment. One was shifted to hospital for further investigation. Detail investigation of the incident is being carried out. "Byco management has assured all injured for best health care treatment"
Oct 28, 2016 1st Quarterly Report for Fiscal Year 2016-17. Oct 05, 2016 Annual General Meeting of Byco Petroleum Pakistan Limited will be held on 26th October 2016 at 2:30 p.m at the Moosa D. Desai Auditorium,ICAP,Clifton Karachi. Oct 05, 2016 Annual Report of Fiscal Year 2015-16. Oct 05, 2016 Byco Blend Autumn 2016. Sep 06, 2016 Byco announces profit of Rs 1.4 billion in FY16. Aug 08, 2016 Scheme of arrangement for the amalgamation of Byco Oil Pakistan Limited and Byco Terminals Pakistan Limited with and into Byco Petroleum Pakistan Limited. 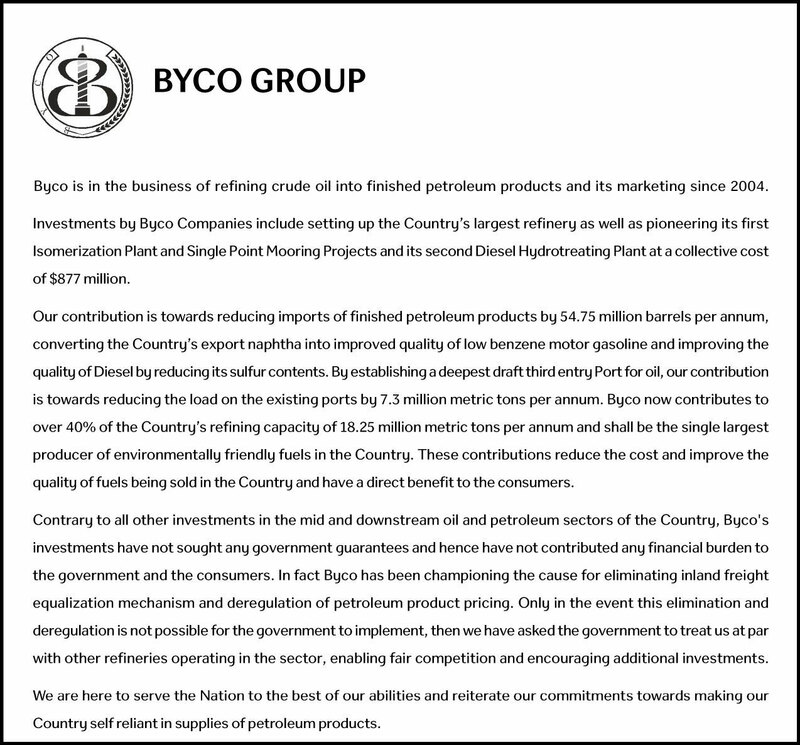 Aug 08, 2016 Notice of the Extraordinary General Meeting of Byco Petroleum Pakistan Limited. July 18, 2016 ELECTION OF DIRECTORS - Notice under Section 178(4) of the Companies Ordinance, 1984. July 11, 2016 Extraordinary General Meeting of Byco Petroleum Pakistan Limited will be held on 26th July 2016 at 9:30 a.m at the Beach Luxury Hotel, Karachi. October 27, 2015 This morning (Tuesday, October 27, 2015) there was an incident causing a fire in a section of refinery (Crude Oil Heater) of Byco Oil Pakistan Limited, Mouza Kund, Lasbella, Balochistan which has been controlled by Refinery’s Emergency Response Team. The other refinery (Byco Petroleum Pakistan Limited) that was on-line at the time of the incident is unaffected and will continue to supply Byco’s customers with Fuel Products. All EHSS (Environment, Health, Safety and Security) protocols are in place and safety checks are being made. October 08, 2015 Annual General Meeting of Byco Petroleum Pakistan Limited will be held on 29th October 2015 at 8:30 a.m at the Beach Luxury Hotel, Karachi. December 26, 2014 Annual General Meeting of Byco Petroleum Pakistan Limited will be held on 19th January 2015 at 9:30 a.m at the Beach Luxury Hotel, Karachi. May 23, 2014 Extraordinary General Meeting of Byco Petroleum Pakistan Limited will be held on 16th June 2014 at 9:30 a.m at the Beach Luxury Hotel, Karachi. Jan 9, 2014 Annual General Meeting of Byco Petroleum Pakistan Limited will be held on 31 January 2014 at 10:30 a.m at the Beach Luxury Hotel, Karachi. June 17, 2013 Extraordinary General Meeting of Byco Petroleum Pakistan Limited will be held on 8th July 2013 at 9:30 a.m at the Beach Luxury Hotel, Karachi. Feb 28, 2008 Joint Venture with Abraaj Capital Ltd.